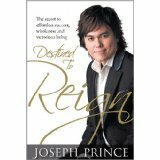 Joseph Prince, Destined to Reign: The Secret to Effortless Success, Wholeness and Victorious Living (Tulsa, OK: Harrison House, 2007). If you combine a Word of Faith understanding of biblical promises with a Dispensationalist understanding of grace, the result is Destined to Reign by Joseph Prince, a book about “being radically transformed by His grace and His grace alone” (p. ix). How do we experience this “life of victory”? Through grace. “Many believers are defeated today because they are struggling to qualify themselves for God’s blessing by their own works. Self-effort will rob you of reigning in life by His grace. You cannot earn your salvation, your healing, or your financial breakthrough by your own efforts. If the greatest miracle—being saved from hell—comes by grace through faith, and not by your works, how much more the lesser miracles, such as healing, prosperity, and restored marriages” (p. 10). Regarding hyper-Paulinism, Prince writes: “The best way to understand the gospel, therefore, is not to base it on what you have heard from various sources, but to go back to what the apostles preached in the early church. Let’s examine what Apostle Paul, the apostle of the new covenant, preached. After all, Paul was the apostle whom God appointed to preach the gospel of grace. He received more revelation on the new covenant of grace than all the other apostles put together, and he was responsible for writing more than two-thirds of the New Testament” (pp. 73, 74). Regarding “rightly dividing,” Prince writes: “There is a lot of confusion and wrong believing in the church today because many Christians read their Bibles without rightly dividing the old and new covenants. They don’t realize that even some of the words which Jesus spoke in the four gospels [sic] (Matthew, Mark, Luke, and John) are part of the old covenant. They were spoken before the cross as He had not yet died. The new covenant begins only after the cross, when the Holy Spirit was given on the Day of Pentecost” (p. 92, emphasis in original). This emphasis on grace vs. law leads Prince to contrast faith and works, which are understood as self-effort: “My friend, I have good news for you today: Faith is not a struggle. The hearing of faith and the works of the law are total opposites. And since the law is about our self-efforts, there is no self-effort in faith” (p. 271, emphasis added). That is why the subtitle of the book is “The Secret to Effortless Success, Wholeness and Victorious Living” (emphasis added). In other words, we might say that not only does Prince believe in justification by grace through faith, but also in sanctification by grace through faith. “It is clear that if a person lacks good Christian qualities like self-control, godliness, and brotherly kindness, it is not because he lacks discipline, but because he has forgotten the main clause of the new covenant. He has forgotten that the blood of Jesus has purchased for him the forgiveness of all his sins. Beloved, if you remind yourself daily that you have been cleansed from all your sins, you will exhibit more and more of these Christian qualities. Your heart will overflow with self-control, godliness, perseverance, brotherly kindness, and love” (p. 103). Critiquing Destined to Reign is a tricky proposition because a few diamonds of genuine biblical insight about grace are mixed in with lots of cubic zirconia of nonsense, but let me try. First, Prince’s Word of Faith understanding of biblical promises is unbiblical. Yes, the new covenant promises believers forgiveness, resurrection, prosperity, and a kingly role. But how those promises are realized in this present life is complicated. Sins are forgiven, but believers still experience death, financial frustration, and powerlessness. The biblical explanation for these experiences is that we will not experience the promises in fullness until the age to come. The Word of Faith understanding of biblical promises is thus an example of over-realized eschatology. Second, Prince’s explanation for these negative experiences is that we are laboring under self-condemnation. He writes, “the deepest root is condemnation” (p. 131). And, “There are many believers who are suffering from sicknesses and diseases because of guilt. Whether or not there is any real basis for their guilt and condemnation, the guilt and condemnation are still destructive. That is why the gospel is so powerful. It is the good news of God’s grace and forgiveness that frees the believer from every sense of feeling dirty or condemned and gives him the power to break free from the vicious circle of condemnation and sin” (p. 290). I find this explanation for (at least some) people’s sickness odd. Elsewhere, Prince rights: “By the way, a believer should never feel guilty for being sick. We have to be careful not to create a culture in the church where people think that you will never be attacked by symptoms of sickness if you are walking with God. Having a sickness or disease does not mean that you have sinned or that God is teaching you a lesson. It just means that your healing is on its way!” (p. 162). I agree. But if we’re going to decouple sickness from sin or chastisement, why not decouple it from self-condemnation too? Perhaps sickness has less to do with spirituality and more to do with physical conditions like bad diet, no exercise, and stress or with germs, viruses, infections, and congenital defects. Third, Prince’s hyper-Paulinism doesn’t get Paul right. Paul is not against works or self-effort per se, he is against their being used as the ground of justification. Paul’s vision of sanctification is not “effortless,” in other words. Thus, for example, in Ephesians 4:17–32, Paul exhorts the Ephesians to “put off your old self,” “be made new in the attitude of your minds,” and “put on the new self.” This requires effort. It may even require hard work. But the motivation for this effort is not the hope of gaining God’s favor. God’s favor has already been bestowed. That is, as it were, the diamond of insight in Prince’s book. Whatever work the Christian performs is motivated precisely by the knowledge that one already has God’s favor. Work, then, is not the ground of justification. Rather, work—the work of holiness—is the expression of having been justified. For us believers, the moment we received Jesus, all our sins were forgiven. We are not to live from confession to confession, but from faith to faith in Jesus Christ and His finished work. You see, there are no two ways about it. If you believe that you have confess your sins to be forgiven, then make sure that you confess everything! Make sure that you don’t just confess the “big sins” (“big” in your own estimation). Make sure that you also confess your sins every time you are worried, fearful, or in doubt. The Bible says that ‘whatsoever is not of faith is sin.’ So don’t just confess what is convenient for you. Make sure that you confess everything. If you really believe that you need to confess all your sins to be forgiven, do you know what you would be doing? You would be confessing your sins ALL THE TIME! How then can you have courage before God? How can you enjoy liberty as a child of God? I tried it and it is impossible! (pp. 106, 107). Well, yes, if you think your confession of sins is the reason God forgives you, you’ll be anxious and enslaved. On the other hand, if you think God’s faithfulness and righteousness is the ground of your forgiveness, you’ll confess your sins freely and joyfully. The question, then, is not whether we confess our sins, but for what reason and with what motivation. Because Prince misunderstands the reason and motivation for confession, he comes close to doing away with the entire practice. Two subsidiary points need to be made here: (1) Prince is simply wrong that 1 John 1:9 was written to Gnostics, not Christians (p. 106). The only letter is addressed to Christians. (2) Jesus himself taught us to pray, “Forgive us our debts, as we also have forgiven our debtors” (Matt. 6:12). Though Prince does not set this verse aside explicitly, others who make the type of argument he makes about ongoing confession—I’m thinking of Bob George, for example—say that Jesus’ instruction came “before the Cross” and is thus not binding on the Christian. And thus does hyper-Paulinism exalt the apostle over the Sender, the servant above the Master! It takes some hair to set aside Jesus’ teaching on the basis of Paul, especially when you’ve misinterpreted Paul. Fifth, another way Prince goes wrong is in his entirely negative view of the Law. For him, it has only a negative purpose. “God gave the law for one purpose, and that is by the law, the world would the knowledge of sin, and recognize their need for a Savior. Without the law, there would be no sin” (p. 16). And, “Let me give you a practical tip on how you can grow in this revelation of ‘no condemnation’: Learn to see the Ten Commandments (the law of God) and condemnation as the same thing. Whenever you read or think about the law, think ‘condemnation’” (p. 151). Is the Law really entirely negative? In reality, the Law has at least three purposes. First, it reveals God’s righteousness. If, as Paul rights, “the law is holy, and the commandment is holy, righteous and good” (Rom. 7:12), it is only so because God is holy, righteous, and good. Second, because the law reflects God’s character, it reveals our sin. It is in this sense that the law condemns. But third, the law, reflecting God’s character and revealing our sin, guides our actions. The Israelites to whom God gave the Law viewed it as a blessing (cf. Pss. 1, 119). Paul himself cited the Ten Commandments in Romans 13:8–10, concluding, “Love does no harm to its neighbor. Therefore love is the fulfillment of the law.” If whenever we read or think about the law, we only think about condemnation, how can we view it as holy, righteous, and good? How can we view it—as Paul viewed it—as a meaningful guide to truly loving behavior? There are some excellent passages in Destined to Reign, ones with genuine biblical insights about grace. However, those diamonds are mixed in with so much cubic zirconia that I cannot in good conscience recommend this book. Doug Clay continues his weekly devotional series in this episode of Monday Motivator, focusing on Psalm 23. Dr. George O. Wood continues his devotional series on the Gospel of Mark, in this episode drawing spiritual lessons from Mark 10:32. Two weeks ago, I spoke at SeaCoast Grace Church from John 13:1, 34, 35 on the topic, “Simplify Your Life and Improve Your Relationships.” Here’s the video. Mitch Stokes, A Shot of Faith to the Head: Be a Confident Believer in an Age of Cranky Atheists (Nashville: Thomas Nelson, 2012). $16.99, 252 pages. Is belief in God irrational? Does science show that God doesn’t exist? Does evil? Over the past decade, New Atheists such as Richard Dawkins, Daniel Dennett, Sam Harris, Christopher Hitchens, and Victor J. Stenger have answered these questions affirmatively. Their best-selling books have promoted the ideas that Christian faith is based on insufficient evidence; that in light of scientific advances, God is a “failed hypothesis”; and that suffering—when not actively caused by believers—disproves God’s existence. Stokes disagrees. Building on the philosophical insights of Alvin Plantinga (who blurbs the book), Stokes argues that theistic belief is rational, that science points to a designed universe (and where there’s a design, there’s a Designer), and that the problem of evil actually points to an incoherence in atheism (for how can there be moral law without a Moral Lawgiver?). One-sentence summaries don’t do justice to the nuances of Stokes’s arguments, but they point in the right general direction. Although New Atheists can read this book with profit, its subtitle points to Stokes’s intended readers, namely, Christians. He aims to help them “be a confident believer in an age of cranky atheists” (and I would’ve added, “atheist cranks”). It is less a book of apologetics, then, than a book aboutapologetics. And that’s a shame, for the Christian book market is saturated with apologetics books written for Christians, and Stokes writes clearly and winsomely enough to directly engage nonbelieving readers. Nevertheless, the book is still worth reading, if only for its discussion of evidentialism. In epistemology, evidentialism is the notion that, “to be rational, a belief must be supported by sufficient evidence.” The “evidentialist objection” to theistic belief is that it “is not supported by sufficient evidence and therefore is not rational.” Some Christian apologists subscribe to evidentialism and think Christianity crosses the evidentialist threshold for rationality. Following Plantinga, however, Stokes argues that evidentialism itself is self-defeating, since the chain of evidence for it—or for any other belief—will be circular or infinitely regressive, or will terminate in a basic belief that requires no further evidence. Since circular reasoning and infinite regresses do not produce knowledge, for evidentialism to work, it must be grounded in a basic belief, a belief which requires no evidence. Which means that evidentialism is a belief that doesn’t have sufficient evidence. Obviously, that’s a problem for evidentialism. Thankfully, there’s a better way to understand rationality. Again, following Plantinga, Stokes argues that “a rational belief is one formed by a properly functioning cognitive faculty operating in the appropriate environment.” If, for example, my eyes are working properly and there is enough daylight for me to see clearly, I will form the belief, when I look out my window, that there are cars parked outside my office building. I don’t need to infer this belief from other beliefs or provide a chain of evidence for it. Such a perception is a basic belief. There are many other kinds of beliefs that are basic in this way: beliefs formed on memory, for example, or testimony or personal experience. Perhaps, Stokes argues (again following Plantinga), belief in God is also such a basic belief that doesn’t need an argument, let alone “sufficient evidence,” to render it rational for the believer. As Stokes point out, basic beliefs have potential “defeaters.” Perhaps, for example, my perception of cars in the parking lot below has been caused by a holograph that my coworkers pasted to my windows. Stokes interprets science and evil as potential defeaters for belief in God, but offers arguments for thinking that both potential defeaters are unsuccessful, based on the design of the universe and existence of a moral law. While a believer can be rational in the absence of such arguments or evidences for faith, Stokes nonetheless thinks arguments can be helpful in clearing away objections and in shoring up a Christian’s faith. How, then, should a Christian use this book? In two ways, one intended by Stokes and another not. The intended way is as a manual in Christian apologetics. The unintended way is as an introduction to Alvin Plantinga’s epistemology and philosophical theology. Either way, I highly recommend this book to Christian readers.